We spotted a great new Swiss Chalet coupon! Get this Delivery Meal Deal for only $14.99. This includes 1 quarter chicken dinner, 1 appetizer and 1 can of pop. This coupon is valid May 11-June 12, 2016. Enter the coupon code SC135 at checkout. 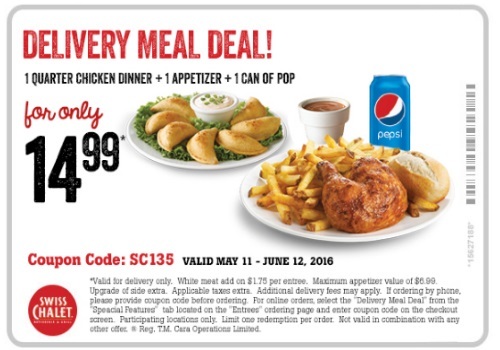 Click here to order from Swiss Chalet.